A young squirrel experiences the wonders of forest life and befriends a human toddler in this collectible edition of a classic animal story from the author of Bambi. 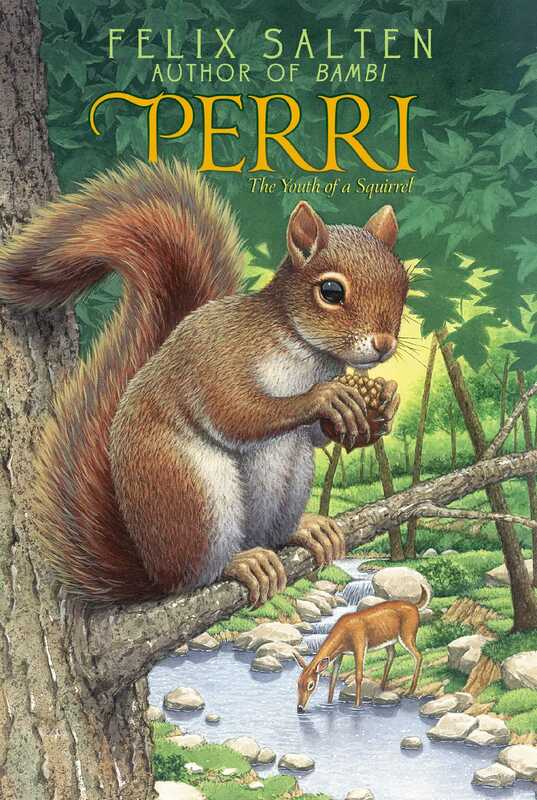 Perri is a young squirrel living in Bambi’s forest. She grows up, learning about survival, friendship, and love as she observes and interacts with the complicated world around her. Most exciting of all, she meets a three-year-old human girl who can understand and talk to animals! Called an “exquisite thing” by a 1938 Kirkus Reviews, this heartwarming classic is now available to a whole new generation of readers in this beautiful repackaged edition. WHISH! WITH A RUSH THE squirrel whizzed down from the treetop, spreading all four legs wide, bushy tail twitching like a loose rudder. It was hardly a leap, but rather a drop from the sky in mad terror. Before one could even hear the twigs rustle, the dainty creature was sitting completely bewildered in the lap of little Anna. The two looked at each other, puzzled—but only for a second. Then the squirrel whispered breathlessly, “Help me!” The child spread tiny hands over her trembling guest, who had fallen as though from heaven, and was cowering under the living roof of fingers. Anna felt the heart of the fugitive beating wildly. Up in the treetop the leaves rustled softly, and the branches bent a trifle, Anna looked up. She smiled, for up there the marten was creeping about. He was prowling, taking care that his sly, dangerous face should be seen only seldom. His prey had escaped him; and at the moment of leaping after it, he had caught a human scent dangerously near. This he hated; it hampered him. Now he hesitated. The May morning dawned gray and wan; the sun had not yet risen, but Anna was already sitting on her little bench in the grass near the lodge of her gamekeeper father. Everything was waking up in the forest round about. Before the first rays tipped the leaves of the treetops with gold, the reveille of the cuckoo rang out. The fluting of the blackbird was heard, the joyful note of the thrush, the piercing laughter of the woodpecker, the song of the finch, the whispering of the titmouse. These little folk were sure that fine weather was coming. They greeted the new day. Anna, a little girl of three, sat here as she did every morning when the weather permitted. Here under the great beech the morning sun reached far, and stayed long. In the afternoons and evenings she sat around in the grass, played in her silent way or sat by the hazel bushes which, with the blackthorn hedge, surrounded the small plot in front of the house. She had big brown curls that fluttered gently around her head, and a delicate but healthy face; in short, she looked like the cherubs the old German artists were so fond of representing with heavenly musical instruments in their hands. Anna was all alone, but she felt little loneliness, neither indoors nor—least of all—out in the woods. She had no mother. Her grandmother had little time to spend with her once the necessary things were tended to. The child ruled kindly and gently, but hers was an unlimited monarchy. Her father loved the forest, loved hunting, loved the game which he protected and sometimes shot, or chased out of the bushes for his master to shoot; he also loved two dogs, the dachshund Fido and the slender, spotted pointer Treff; of course he was fond of his mother; but above all he loved Anna, his only child. He called her Annerle, saying the diminutive with a singing intonation, and Anna would reply, singing too, “Ye-es!” Often this was the whole of their conversations. It was enough; their love for each other could not be more truly expressed. Ever since she was two—a long time—Annerle had had her way about getting up before dawn, when her father left his bed, and going out with him into the sleeping forest. There she would sit quietly, enjoying the awakening of the small folk, and would wait patiently until her father came back from his stalking. Then she would sleep two or three hours, be fresh again at noon, and spend the rest of the day just as she had spent the morning. Annerle was now in that mysterious state where children are still distant from adults, and as yet feel no urge to be grown up. For the moment they enjoy the infinite blessing of having no fate; they live in natural innocence, like Adam and Eve before they ate the apple from the tree of knowledge. And, as in Paradise, all creatures confide their friendship to children. Perhaps this is because the animals, half-consciously or quite unconsciously, have an inexplicable hope and longing for the old original harmony between man and beast. If only human children could grow up with the memory of all the gentleness, all the patience and devotion, which they have had from living creatures! But when they grow out of the dawning of their lives, they forget everything. And they forget, too, that in babyhood, when they did not know the language of men, and only babbled it clumsily, they understood the speech of all innocent creatures. This understanding, word for word, vanishes forever; even the memory of it vanishes, and animals become to them what they are to everyone else—dumb friends. “Then I’ll go look after Perri,” the squirrel decided. She hopped to the ground, leaped wide-legged through grass and bushes, and was high up the trunk of the nearest oak in an instant. She whisked like a flash through the treetops, and vanished. The sun had risen magnificently. In the sky the clouds scattered, and the pale green of the heavens was overspread with a delicate blue. There was a sharp crack in the distance. After some time Annerle’s father came home with the owner of the forest. She and the dogs ran to meet them. Her father at once picked her up in his arms to caress her. Then he patted the two dogs. “Work for you, Fido,” he said. “First let’s have breakfast,” the owner decided. The two sat down at the table in front of the house, with Annerle between them. Grandmother soon brought coffee, bread, butter and eggs. Meanwhile Annerle began to talk, and as they ate she went on eagerly about the squirrel that had fled to her; what it had said; about the warning cries of the magpie and the jay; about their reassurance when the marten had gone, and about the good news of Perri which the finch had brought. Her speech was childish, full of those imperfect, often homemade, words peculiar to children. “I don’t quite understand what the little one is talking about,” the owner whispered. Annerle heard him and began again at the beginning with redoubled enthusiasm. Annerle thought they understood her now, and she started off again. But they did not understand her at all. The two adults guessed rather than understood that she was making an oft-repeated attempt of nature to be a link between human beings and other creatures.